You don't have to be a botanist to be successful at propagating ferns from spores. With some basic knowledge, you can cultivate a wide variety of ferns at home. Learn how to harvest or acquire spores, how to create the best growing medium, and how to ward off pests and care for your mature plants. Acquiring some spores to sow is the first order of business. There are two ways to obtain spores. You can join international fern societies with spore exchanges, such as the American Fern Society or the British Pteridological Society. There are also many excellent regional societies that offer spores. Members of these organizations are able to order spores for a very modest fee per packet. The listing of spores available can be quite extensive, so this is an excellent way to try new ferns or find very unusual and rare ones. Keep in mind, however, that the particular type of spore that you request may not be in the packet that arrives in the mail, even if the label says it is. These spore exchanges depend on donations from their members, and mistakes are made. Sometimes stray spores of other ferns get mixed in the packet due to poorly cleansed fronds or contamination during packaging. Always reserve a healthy bit of skepticism about any spore-grown fern until you have verified its identity by looking it up or asking an experienced grower about it. What's more, spore-exchange packets may contain mostly sporangial debris mixed with hairs and scales from the frond, with very few spores. Sowing spores mixed with this much chaff generally leads to failure and frustration. On the other hand, when a fern is otherwise unobtainable, it may be worth risking failure on the off chance that a few spores will succeed. If you already have a collection of ferns or have permission to gather fertile fronds from someone else's collection or from the wild, then you don't have to depend on spore exchanges. Gathering spores only requires patience, persistence and attention to detail. A 1OX hand lens is useful for beginner spore collectors because it enables you to determine whether the sori are immature, mature or past mature. Remember that each fern genus has a distinctive soral pattern with or without distinctive indusia. For example, ferns in the genus Dryopteris have round sori protected by kidney-shaped indusia. 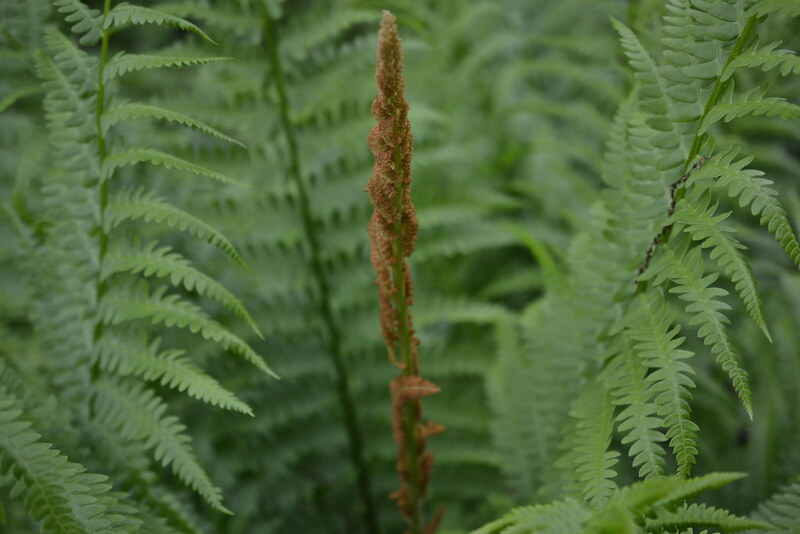 For the most part immature sori are a pale whitish color, although there are exceptions, such as Dryopteris erythrosora, which goes through a brilliant pinkish-red to ruby-red stage before maturing. The indusium closely envelops the sporangia, leaving only a slight span between its lower edge and the surface of the pinna. As the spores inside each sporangium mature they get darker, until they are a deep brown or black. The edges of the indusium begin to lift, allowing the ripe spores to bulge out. Eventually the indusium shrivels up, and the exposed spores are ready to be catapulted into the air. Not all spores mature to a deep brown or black, nor are all sporangia covered with an indusium. Polypodiums are ripe when they are buttercup yellow, osmundas when they are green, and both have probably been dispersed, or dehisced, when the soral remains are a deep, burnished old gold. Although the sporangia of both these genera are without indusia, they have a similar dispersal mechanism to those that do. The sporangium in most ferns is a thin-walled case, usually on a stalk, that has a ring of thick-walled cells known as the annulus, which aids in opening the sporangium when the spores are fully mature. This belt-like ring of cells encircling the sporangium resembles a medieval knight's visor when viewed from the side. When the spores are ripe, the annulus breaks near the base of one side, tearing the sporangium apart, and arches backward. The annulus snaps forward abruptly, flinging the spores away from the frond. You can easily observe this phenomenon with a 2OX hand lens by placing a ripe pinna or frond under a bright light. The heat from the light will dry the sori and trigger the annuli into action. This is a thrilling sight but be forewarned that you'll have thousands of spores all over yourself and the immediate vicinity! This clever spore dispersal system works to your advantage as a spore collector. Fronds or pinnae with mature sporangia can be placed sporangia-side down on a sheet of clean paper onto which the spores will be released. If you have a large collection of different ferns growing together or your ferns grow among mosses you may want to first cleanse the fronds to cut down on foreign contaminants. Briefly soak or swish picked material in a 5 to 10 percent bleach solution, rinse with running water, shake and place the fronds, sporangia side down, on clean paper. Paper with a smooth finish is best for packaging spores. Because I harvest large quantities of spores from ferns of all sizes I use a large roll of white butcher paper from which I cut the sizes required. Each piece can be made into an origami-style envelope suitable for storing the spores until they are needed. Write the name of the fern, if known, date collected, where collected and any other information you'd like to remember. How do you know when to pick fronds or pinnae to harvest spores? In addition to the color of ripe spores, there are other conspicuous features to look for. The most telling sign that the sporangia have dehisced are frayed, scruffy-looking sori. Whereas ripe sori are plump and firm with little brown, black, yellow or green spheres, spent sori are generally a dull cinnamon brown. If you still aren't sure when to pick the fronds, do a little experimenting. The sporangia mature from the base to the apex of the blades, and not all blades mature at the same time. Remove the pinnae or pinnules from different sections of one or more blades. Place these in separate packets carefully labeled so you will know which fragment yielded the most spores. Don't forget to closely observe each sample so that next time you'll be able to recognize the ripe spores. Cleanliness is the key to successful propagation from spores. After you've cleansed the fertile frond in the 5 to 10 percent bleach solution, tap the frond to release spores still stuck to it and discard it. The spores will be mixed with sporangial debris and maybe even some scales and hairs from the frond. The debris is lighter in color or at least a slightly different color from the spores and weighs less. By carefully lifting the paper and gently tapping from underneath, you can coax this fluffy debris to slide off the paper and discard it. An even more thorough cleaning can be achieved by sifting the spores through tissue paper used for cleaning camera lenses. I use two pieces laid across one another with the grain facing in opposite directions. The spores, generally smaller and heavier than the unwanted debris, fall through, leaving the debris in the lens paper. You can also use a fine screen; however, thoroughly cleaning it between siftings is time-consuming. Spores can be cleaned either well ahead of sowing or when you are ready to sow. I generally tap and remove fronds and do a preliminary "paper tap" cleaning before filing my spores away. I save the final operation of sifting through the lens-tissue for when I sow, as this tissue is a wonderful method for sprinkling spores evenly over the sterile medium. There are no hard and fast rules about what kind of medium or container is best. Use what is available and works best for you. One thing is crucial, however: both the medium and the container must be as sterile as possible. Possible containers range from disposable plastic cups to nursery flats. A tight-fitting cover is essential to maintain humidity and keep out air-borne contaminants such as the spores of other ferns, fungi and mosses. Grocery stores offer an array of containers with clear plastic lids. Plastic food wrap and rubber bands are an inexpensive way to cover almost any container. Some growers use vaseline to maintain a seal between the lid and the container. The container may or may not have drainage holes, depending on your set-up. Watering can be accomplished by misting from the top or by capillary action from the bottom. There are advantages and disadvantages to both. Every time you open the cover to mist, contaminants can enter. However, sometimes bottom watering must be supplemented with overhead misting to provide a film of water for fertilization. Lightly moisten the mix while thoroughly combining the ingredients. The various media used to raise ferns from spores include garden soil, well rotted and sifted compost, milled sphagnum moss, peat moss, vermiculite, perlite and assorted combinations of these. The Fern Growers Manual by Barbara Joe Hoshizaki (Knopf, 1979) thoroughly covers the various possible combinations. Soilless mixes are used by most commercial growers because they can be purchased premixed or mixed to meet specific requirements and are easily sterilized. The mix I prefer is two parts perlite to one part peat moss with micronutrients and timed release fertilizer added (see box, above). The quickest way to sterilize the growing mix is in the microwave. Wet the medium to a sloppy mud-pie consistency in a plastic bag. (Grocery bags with handles are excellent.) Place the bag in a microwaveable dish tall enough to catch the excess water that comes out of the bag during the steaming process. (Be sure to tuck the opening of the bag down into the dish or water may come oozing out the microwave door!) You may need to experiment to find out how long to "cook" the mix as microwaves vary. I set my ten-level microwave on level 3 and cook for 50 to 60 minutes. You can also sterilize mixes in a regular oven, baking for two hours at 250 to 300° F. Two large metal mixing bowls make a nice steam chamber but any large pot with a tight-fitting lid will do. The mix should reach a temperature of 180° F for 30 minutes. Use a meat thermometer pushed in to the center of the mix to determine the total amount of time needed. Next, pack the sterilized mix into the sterilized containers. Containers should be rinsed in a 10 percent bleach solution; rinsing is optional. Putting containers through a complete dishwashing cycle should also sterilize them sufficiently. I prefer to tamp down the mix in the containers when it is still quite warm, as the warm air that rises up through it helps prevent foreign air-borne spores from drifting down to the sterile surface. If the containers have drainage holes, you can also sprinkle the surface of the mix with very hot water before covering the containers to prevent contamination. Containers without drainage holes should be covered and sprayed with sterile water just before sowing the spores, but not too much. Find a clean, draft-free place in which to sow your spores. I generally sow the most difficult or slowest-growing ferns first and the easiest or fastest-growing ferns last; this way, if there are any stray spores, the former will not be tainted by the latter. Sow the spores by lightly tapping them from the packet or off a flat sheet of paper, or by sifting them through lens tissue. Label the culture, making sure to note the name of the fern, date sown, source and any other information you want to remember. The label can be a piece of tape on the outside of the container or a plastic label stuck inside the container; I prefer the latter as the label can then move with the young ferns through the various transplantings. A controlled environment with even temperatures and controlled illumination will encourage faster development in many spore cultures. Place the containers under fluorescent lights (anywhere from 6 to 24 inches from the lights) or in indirect natural light. Some species require a period of darkness before being exposed to light. To be on the safe side, I usually let my cultures "rest" for a day in a dim area before transferring them to a lighted growth chamber. Most books recommend leaving artificial lights on 8 to 16 hours daily. I leave the lights on continually with no adverse effects on most of the plants that I grow. The temperature of the growing area can range from about 55° to 75° F, but it should remain fairly stable, within five to six degrees. Some temperate species, especially some of the deciduous ones, seem to prefer the cooler end of this range. Within four to fourteen days you should notice a translucent green film on the surface of the medium, a sign that germination has taken place. The newly emerging gametophytes, which have begun to grow from long, tongue-like threads into the heart-shaped prothalli, are too small to see without magnification. If just enough but not too many spores were sown, the culture will have a solid mat of prothalli in two to five months. In a culture that is too sparse, the growing medium is exposed to possible contamination and fertilization between prothalli is difficult. In a very crowded culture, the prothalli may not develop properly and may be more susceptible to fungal invasions. Crowded cultures can be thinned. Remove the fingernail-sized clumps of prothalli with tweezers, forceps or your fingers. If you have lots of room you can transplant the clumps into a larger container or several small ones. Make a small indentation with a tool or your pinkie finger and gently press each clump into the medium. Sterilizing your tools, even your fingers, in a 5 to 10 percent bleach solution before and between transplantings of different ferns is highly recommended. After transplanting, mist with distilled or cooled boiled water. The transplanted clumps will continue to grow and once again make a solid mat of prothalli. The length of time required for prothalli to produce sporophytes varies according to species and environmental conditionsit can be anywhere from six to twelve months. If sporophytes are not produced after a reasonable length of time, try flooding the entire culture with a thin film of sterile water for a few hours, then remove any excess not absorbed. Once sporophytes begin to develop, you may have to thin again. Continue to keep the containers and the mix as sterile as possible because the growing mix will have had to be exposed during various procedures. As they develop more fronds you can gradually uncover the containers by propping open the lids to let in air. Commercial growers tend to transplant in clumps, even the larger ferns, as ferns seems to prefer the "buddy system." Clumps of no more than two to three sporelings are most successful. Once ferns reach roughly 15 to 25 percent of their mature size they can safely be divided into single plants if you desire. Despite all precautions to keep the work area, tools and growing medium sterile, contaminants do sneak in. The close conditions under which spore cultures are kept favors the growth of molds and algae. Check regularly for signs of infection. Blue-green "algae" will turn the opaque prothalli a translucent sooty green that grows darker as the prothalli deteriorate. Furry, dingy white to ashen gray wisps on the prothalli or foliage are caused by gray mold. Cool moist conditions stimulate this mold and an increase in temperature, good air circulation and decrease in humidity will slow it down. As soon as you spot an infection, remove the infected area and at least 1/2 inch of plant tissue beyond that. Fungicides usually slow the progress of these infections but don't cure them. They may also inhibit the growth of the prothalli of some ferns. Algae, mosses and liverworts do not directly attack the prothalli or sporelings but can impede their development by crowding and shading them. Green ooze, grayish thatch or stringy green strands are probably algae. Remove the algal patches as thoroughly as possible to give the prothalli or sporelings a chance to develop without heavy competition. This procedure may have to be repeated before the sporophytes can hold their own. I have spent many hours pulling the stringy algae from cultures. Mosses and liverworts also should be removed as soon as you spot them. They favor bright light and, like algae, tend to be a problem in older cultures, particularly those with the slower-developing ferns. Fungus gnats and shore flies are an absolute menace and can cause serious damage in a closed culture. The minute, white, worm-like larvae slither through the upper surface of the medium, destroying vital rhizoids. Adult fungus gnats have light-colored wings and adult shore flies have dark ones. It is important to distinguish between the two because fungus gnat larvae can be controlled by a biological larvicide but shore flies require a toxic treatment not recommended for use around the home. Aphids can be controlled with a mild solution of dishwashing detergent. To avoid damaging your cultures, leave the detergent solution on the fronds for about 30 to 60 minutes and then be sure to spray with sterile water to remove excess soap and aphid bodies. Prevention is the best pest-management strategy. Use sterile containers, medium, and spores, and keep yourself and your work area free of contaminants. Wash your hands before and between handling cultures. Make sure your clothing is cleanand don't bounce from outdoor gardening to working on your cultures because you'll have all sorts of microscopic contaminants on your apparel. Consider chemical pesticides and fungicides only as a last resort. Your local cooperative extension agent is the best source of information on which ones to use. Even if you've successfully run the course from spores to prothalli to mature sporophytes, you may have another obstacle to contend with"rogue" spores that have produced plants that you did not intend to grow. As you become experienced you'll be able to recognize these invaders and choose whether to keep them or discard them. You may also be surprised to discover that some spores produce plants that do not absolutely resemble the parents. Fern species come "true" to their parentage allowing for the normal range of variation within an individual species. Some species reproduce as if they were all cut from the same cookie cutter. Others exhibit a tremendous ability to produce variations strikingly different from the parent. Some of these variations may come relatively true to type when grown from spores, but others, most notably Athyrium filix-femina, Asplenium scolopendrium and Polystichum setiferum, may produce some progeny that are not quite true to the original named variety. Even within these species there are exceptions, however. For more information on this intriguing subject, see The Cultivation and Propagation of British Ferns by James W. Dyce. Mr. Dyce has been my unflagging mentor for nearly two decades. I hope I have been able to instill in you a fraction of the passion for ferns that he has helped instill in me. You don't have to sow spores to increase your collection of ferns. Vegetative, or asexual, propagation is much simpler. It involves taking parts of a fern or young plants that have grown by a bud directly from the parent fern and planting them. The resulting new plants mature quickly. But there is one drawback to vegetative propagationyou're limited to the plants in your own or a friend's collection, whereas propagation by spores gives you access to a much wider array of ferns from across the country and around the world. The simplest way to propagate vegetatively is to divide branching rhizomes into separate plants. In ferns with creeping rhizomes, such as hay-scented fern (Dennstaedtia punctilobula), many divisions may be possible from a modest clump. You're more likely to have success with a larger division, so make sure that each one has at least one or two growing tips. One notable exception to this rule is Himalayan or evergreen maidenhair fern (Adiantum venustum), which thrives when its rhizomes are ruthlessly reduced to mere fragments. Use a clean, sharp knife or pruners to cut divisions. You can also tease apart rhizomes that have become entwined, taking care to salvage as many roots as possible. I find that long creeping rhizomes do best when planted in a loose mix in a low, wide pot instead of a standard taller pot. In some species, buds that grow on the frond, rachis or even roots can be manipulated to produce new plants. For best success, in the case of proliferous, or bud-bearing, fronds keep these attached to the parent plant while anchoring them to the ground or a pot of soil. This ensures that the frond remains alive and healthy while the new plantlets are developing their own roots and fronds. If you remove the fronds from the parent, be sure to keep them in a humid environment, such as a covered flat or plastic container, while the plantlets develop or the fronds will dry out. Victorian growers were exceedingly creative and discovered some intriguing vegetative propagation techniques. Because some varieties did not produce spores or did not come "true" from spores and rhizome division yielded too limited a number of new plants, they tried potting up old stipe bases severed from the rhizome. There are some reports in the literature of the day that this technique worked with Dryopteris filix-mas and Dryopteris affinis selections, but I have not tried it. However, I have coaxed old stipe bases of Asplenium scolopendrium var. scolopendrium, the European hart's-tongue fern, to produce plantlets. If you want to give this a try, cut the stipe bases about 1/4" to 1/2" in length and insert them upside down in a rooting mix. Little green pimples on the upper portion of the section above the soil will form, which will develop into plantlets. You can also lay the pieces on the soil surface, but do be sure to keep the severed stipes in a closed, humid environment. I have even seen plastic bags full of leafed-out stipe bases that never made it from the bag to the rooting container! I like to think that this phenomenon was discovered when the stipes, lying about on a propagation tray after a prized "scolly" (the affectionate English nickname for hart's-tongue fern) was potted or cleaned up, eventually grew into plants. Moral of the story: Sometimes dubious bits and pieces may have propagation potential and the experience gained from trial and error takes no more than a little patience and space. Judith Jones is a self-taught fern specialist. Her nursery, Fancy Fronds, in Seattle, has introduced six new ferns to the American nursery trade. She has lectured throughout North America and England and her nursery's displays of hardy ferns have won four gold medals at flower shows in the Northwest. She is a self-proclaimed pteridomaniac. A thin pale green caterpillar has decimated my cinnamon ferns—how do I treat that, and will the fern grow new fronds/leaves? Hi Roberta: A rotting log is a very specific ecosystem. Moving a fern from that environment to soil may not be successful. Some ferns are more particular about their growing conditions than others. Without knowing what kind of fern you have, what kind of tree it is growing in, and what kind of soil you are moving it to, there’s no guarantee your fern will survive. While it may adapt to its new home, it may not, and we recommend leaving it where it is. We recently felled a section of a tree that was dead. It was later discovered that a small portion of the tree had small ferns growing in moss. Can anyone tell me how to successfully transplant ferns of this nature to soil? I am trying to propagate ferns and have what looks like grey/blue/green mold, very thin, where all of the spores have been seeded (doesn’t appear where they haven’t). Is this actually spores maturing, or is it mold? Thank you for the guidance. I am Ketut from Bali. As a biology teacher, I want to show to my students how fern and moss grow clearly from their microscopic stages. It was great to obtain this article. I’ll try at my school biology laboratory. Really enjoyed this article. Very informative and encouraging for a beginner to have a try. I have some questions about spore vitality. Should spore be sown immediately following collection? Also if spore can be stored, what are the best storage containers/envelopes and conditions that will best preserve spore vitality? Many thanks. It’s not a good idea to collect ferns from the wild. Ferns can be difficult to transplant, and unless you can exactly match the soil, light, and moisture conditions in which it was growing, a wild-dug fern is unlikely to survive long. In most places, it is also illegal to gather plants from public lands like parks and recreation areas, and you should get permission from the owner if collecting plants on private land. In addition, many fern species are also becoming rare in the wild and may be listed as endangered. Your best bet is to study your property over a year or so and get an idea of the moisture and shade conditions; in the meantime, contact Maryland plant societies, your local Cooperative Extension, and nearby nurseries to get advice on sustainable sources of ferns that will do well. No doubt there are lots of ferns out there that will love your yard—good luck! Just wanted to thank Judith for this detailed explanation of fern propagation. I’ve often wanted to propagate our local native ferns here in Santa Cruz (California), and now I know how! Maintaining a sterile environment looks like a challenge to me, but knowing the steps gives me confidence to have a go. Thanks again. Thanks for your website. We are in Bethesda, Maryland, and new to ferns. It’s September, and I want to find out about collecting from the wild to home cultivate then cover my yard as it’s completely shaded and I can’t grow a garden. The fertile frond of Osmunda cinnamomea (cinnamon fern) in the Native Flora Garden. Photo by Morrigan McCarthy.